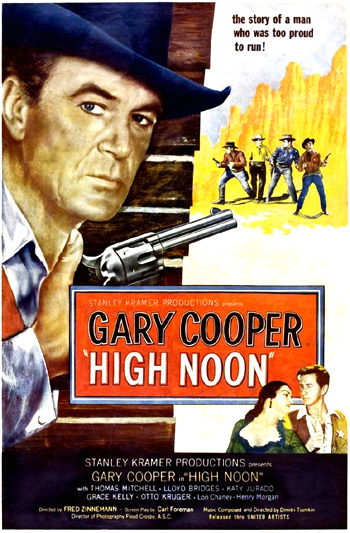 High Noon (1952) is possibly the all-time best Western film ever made - a successful box-office production by Stanley Kramer and director Fred Zinnemann (who also directed From Here to Eternity (1953) and A Man For All Seasons (1966)). The Western genre was employed to tell an uncharacteristic social problem tale about civic responsibility, without much of the typical frontier violence, panoramic landscapes, or tribes of marauding Indians. The film's screenplay by Carl Foreman [this was his last Hollywood film before blacklist exile to London, soon after his work on Home of the Brave (1949), Champion (1949), and The Men (1950)], written during a politically-oppressive atmosphere in the early 1950s when McCarthyism and political persecution were rampant, was loosely adapted from a Collier's Magazine story The Tin Star (by John W. Cunningham) published in December 1947. In fact, the film's story has often been interpreted as a morality play or parable, or as a metaphor for the threatened Hollywood blacklisted artists (one of whom was screenwriter Foreman) who faced political persecution from the HUAC during the McCarthy era due to actual or imagined connections to the Communist Party, and made life-altering decisions to stand their ground and defend moral principles according to their consciences. It also has been interpreted as an allegory of the Cold War and US foreign policy during the Korean War. This taut, tightly-scripted, minimalist film tells the tale of a solitary, stoic, honor-bound marshal/hero, past his prime and already retired, who was left desolate and abandoned by the Hadleyville townspeople he had faithfully protected for many years (symbolically - during the World War II years). Due to the townspeople's cowardice (representing cooperative witnesses before the HUAC), physical inability, self-interest, expediency, and indecisiveness, he is refused help at every turn against a revenge-seeking killer and his gang. Fearful but duty-bound, he eventually vanquishes the enemy, thereby sparing the civilized (democratic) town the encroachment of barbaristic frontier justice brought by the deadly four-man group of outlaws (symbolic of the aggressive threat in the Korean War, or the HUAC itself). Embittered by film's end, he tosses his tin star into the dirt of the dishonorable frontier town. The story of a man who was too proud to run! The dramatic, tightly-compressed, austere black and white film with high-contrast images was shot in a spare 31 days, and the physically-pained, ravaged look etched on 51 year old Gary Cooper's gaunt face was due to actual illness (a recurring hip problem, bleeding stomach ulcers, and lower back pain), and emotional stress due to his recent breakup with actress Patricia Neal after a three-year, well-publicized affair while separated from his wife. The time span of the film (about 105 minutes) approximates the actual screen length of the film - 85 minutes - accentuated by frequent images of the clock as time rapidly dissipates before the final showdown. Cameraman Floyd Crosby's years of filming New Deal documentaries is evident in the film's sparseness, static compositions, and authentic feel. This simple, stark, low-budget Western classic, with a total budget of $750,000, was nominated for seven Academy Awards including Best Picture (won by Cecil B. DeMille's circus epic The Greatest Show on Earth (1952)), Best Director, and Best Screenplay - it was awarded four awards: Best Song for "High Noon (Do Not Forsake Me, Oh My Darlin')" (sung by Tex Ritter throughout the film, lyrics by Ned Washington, music by Dimitri Tiomkin), Best Scoring of a Dramatic Picture (Dimitri Tiomkin), Best Film Editing (Elmo Williams and Harry Gerstad), and Best Actor for Gary Cooper's performance - his second Oscar after a win for Sergeant York (1941). [Cooper's win was an unusual honor, since Western films (and acting roles) are rare nominees and winners in Academy history! The film's theme song was made a popular hit by Western singer Frankie Laine.] Presumably, the Academy felt obligated to honor one of filmdom's greatest directors (DeMille) with the Best Picture Oscar, as his career was coming to an end. A made-for-TV movie was titled High Noon, Part II: The Return of Will Kane (1980) with Lee Majors in the lead role. It was remade as a science-fiction film, writer/director Peter Hyams' Outland (1981) with Sean Connery, with the adapted plot transferred to interstellar space (and ridiculed as "High Moon"). It was also remade as a TV movie by Ted Turner's TBS station with Tom Skerritt as the lead character and Michael Madsen as the heavy named Frank Miller. Other High Noon imitations or variations: the teen comedy Three O'Clock High (1987) took the conflict to a school setting, while The Baltimore Bullet (1980) moved it to a pool hall show-down. The film's credits, accompanied by the "High Noon" title song, play atop a scene of desperadoes gathering on the outskirts of a town. On a blazing summer morning [probably between 1870 and 1880], the three gang members have converged on the small, quiet, arid western town of Hadleyville (population about four hundred). The gunslingers ride by the town's church (one of the town's many seemingly respectable, stable, and supportive institutions), where Sunday morning church bells are pealing as a signal to worship. They are ominously recognized by an old Spanish woman who crosses herself, a fireman, and other townsfolk outside the Ramirez Saloon. One of the three, Ben Miller (Sheb Woolley), rides his unbridled horse uncontrollably toward a sign reading "MARSHAL" - a foreshadowing of the film's conflict. The riders pass the Justice of the Peace's window (the town's courtroom), where the societal ritual of marriage is in preparation. Judge Percy Mettrick (Otto Kruger) is to marry the town's 'ex' marshal, middle-aged Will Kane (Gary Cooper) ["Will" - a richly symbolic name] and a beautiful young Quaker girl, Amy Fowler (23 year-old Grace Kelly in her first major role). [The first view of a clock is in this scene: it is 10:35 am. Another clock reads 10:33 am in the town's barber shop.] Word spreads quickly about the gang members who are identified by the barber (William Phillips) as Ben Miller, James Pierce (Bob Wilke) and Jack Colby (Lee Van Cleef, a frequent Western villain, e.g., For a Few Dollars More (1965), and the "Bad" character in The Good, The Bad, and The Ugly (1966)). Gang member: Noon train on time? During the marriage ceremony, Kane's (and Amy's) first words in the film are "I do." Their wedding guests include the town's senior selectman and ring bearer Jonas Henderson (Thomas Mitchell), ex-Marshal Martin Howe (Lon Chaney, Jr.) and good friend/neighbor Sam Fuller (Harry Morgan, credited as Henry Morgan) and his wife Mildred (Eve McVeagh). [Kane will have individual confrontations with each of the three male guests Henderson, Fuller, and Howe ("the entire board of selectmen in this community") later in the film.] After they are pronounced "man and wife" and the celebration begins, Kane finds privacy in an adjoining room with his new wife and promises: "I'm gonna try, Amy, I'll do my best." The new and younger marshal to replace Kane is expected to arrive the following day, and Henderson assures everyone: "This town will be safe 'til tomorrow." His new bride has firm, pacifist Quaker convictions that deplore violence, and he will be putting away his marshal's star in his last act in office - he removes his badge, a popular Western icon, and pins it on his gun holster, amidst applause. I think I ought to stay. Kane: It's no good. I've got to go back, Amy. Kane: This is crazy. I haven't even got any guns. Amy: Then let's go on. Hurry. Kane: No, that's what I've been thinkin'. They're making me run. I've never run from anybody before. Amy: I don't understand any of this. Kane: (after looking at his vest watch) Well, I haven't got time to tell ya. Amy: Then don't go back, Will. Barber: How many coffins we got? Barber: We're gonna need at least two more, no matter how you figure. You'd better get busy, Fred. Kane: I sent a man up five years ago for murder. He was supposed to hang. But up North, they commuted it to life and now he's free. I don't know how. Anyway, it looks like he's coming back. Amy: I still don't understand. Kane: ...He was always wild and kind of crazy. He'll probably make trouble. Amy: But that's no concern of yours, not anymore. Kane: I'm the one who sent him up. Amy: Well, that was part of your job. That's finished now. They've got a new marshal. Amy: Oh, that isn't so. Kane: I expect he'll come lookin' for me. Three of his old bunch are waiting at the depot. Amy: That's exactly why we ought to go. Kane: They'll just come after us, four of 'em, and we'd be all alone on the prairie. Amy: We've got an hour. Kane: What's an hour?...What's a hundred miles? We'd never be able to keep that store, Amy. They'd come after us and we'd have to run again, as long as we live. Amy: No we wouldn't, not if they didn't know where to find us. Oh Will! Will, I'm begging you, please let's go. Amy: Don't try to be a hero. You don't have to be a hero, not for me. Kane: I'm not trying to be a hero. If you think I like this, you're crazy. Kane: Look Amy, this is my town. I've got friends here. I'll swear in a bunch of special deputies and with a posse behind me, maybe there won't even be any trouble. Amy: You know there'll be trouble. Kane: Then, it's better to have it here. I'm sorry, honey, I know how you feel about it. Kane: Of course I do. I know it's against your religion and all. Sure I know how you feel. Amy: But you're doing it just the same. Oh Will, we were married just a few minutes ago. We've got our whole lives ahead of us. Doesn't that mean anything to you? Kane: You know I've only got an hour and I've got lots to do. Stay at the hotel until it's over. Amy: No, I won't be here when it's over. You're asking me to wait an hour to find out if I'm going to be a wife or a widow. I say it's too long to wait. I won't do it...I mean it. If you won't go with me now, I'll be on that train when it leaves here. Kane: (resolutely) I've got to stay. So everything hinges on the mid-day hour. In the suspenseful film, every minute is packed with tension as time passes, symbolized by numerous instances of clock-watching and quick cuts to images of clocks ticking relentlessly toward the doom of high noon. Many of the fearful, self-serving and cowardly townspeople are leaving in order to be away when Miller shows up. Have you forgotten that I'm the man who passed sentence on Frank Miller? In the 5th century B.C., the citizens of Athens, having suffered grievously under a tyrant, managed to depose and banish him. However when he returned some years later, with an army of mercenary, those same citizens not only opened the gates for him, but stood by while he executed members of the League of Government. A similar thing happened about eight years ago in a town called Indian Falls. I escaped death only through the intercession of a lady of somewhat dubious reputation - and uh, the cost of a very handsome ring which once belonged to my mother. Unfortunately, I have no more rings. At the train station, Amy purchases a ticket for St. Louis. After Ben Miller glances threateningly at her with lusty intentions, she is cautioned to "wait somewheres else like at the hotel, maybe." The clock reads 10:53 am on the mantle in the room where young deputy Harvey eats breakfast with Helen - she realizes he is sulking, "really sore" at Kane, and jealous of the marshal's authority and position after failing to be promoted to the position. As the Judge flees on horseback, he castigates the town: "This is just a dirty little village in the middle of nowhere. Nothing that happens here is really important. Now get out." But Kane is steadfast: "There isn't time." With a fatherly manner, Kane asks a young boy in town to locate Jonas Henderson, Martin Howe and Sam Fuller - and "tell 'em I want 'em here."